After spending the holiday weekend visiting family in New York, I returned to a garden overgrowing with kale and broccoli rabe and bushing basil that demanded picking. The thing about leafy greens that need picking is this: If you don't pick now, you'll have less to pick later. So I picked and picked and picked, half-wondering what I'd do with so much roughage. Then I remembered a recent conversation with my cousin, who reminded me that kale can be tenderized with a bit of rough handling, so I ripped up a bunch, and twisted and squeezed it. With some chopped herbs and a splash of oil and vinegar, a hearty, summery salad was born. 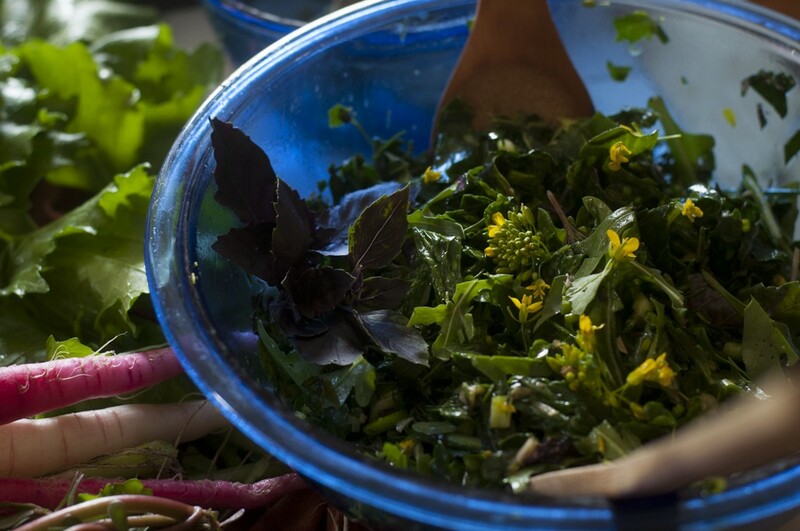 And, if you're one of the hundreds of Vermonters who receives piles and piles of kale in your CSA share, you can make it tonight in 10 minutes or less. 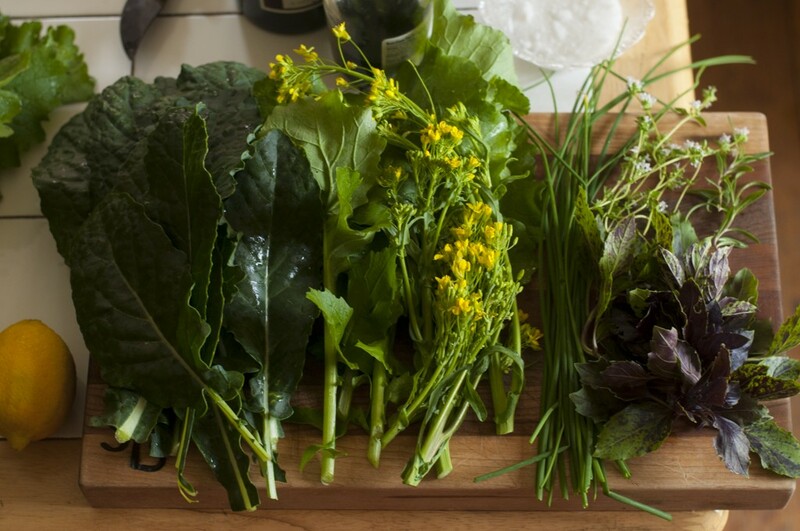 Cut the stems off the kale and broccoli rabe (if using) and reserve. Gather the greens in a bunch and rip into strips one inch wide. Place in a large bowl and squeeze and work the greens until they darken and feel damp to the touch. Set aside. Mince the greens stems, garlic and shallot (if using), along with the herbs. Place in a smaller bowl. Pour olive oil, vinegar, lemon, salt, water and spices into a small bowl or glass jar and mix well. Add pepper to taste, mix again, then stir into stems mixture. Let sit a few minutes so flavors can mingle. Add the arugula or romaine, plus the croutons (if using) to the bruised kale. Pour the contents of the smaller bowl over the greens and work with tongs or wooden spoons until everything is coated. Let sit for a few minutes, toss once more, garnish with flowers or herbs, and serve.